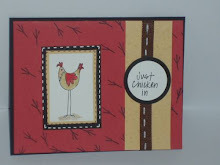 This is a Stampin' Up! stamp set called Artistic Etchings. I belong to a small stamping group and our challenge was to bust out a stamp you bought and never used. This is what I picked. I loved this set in the catalog, then bought it and couldn't decide what to even do with it so it just sat. I inked it up for the first time in a year and this is what I came up with. 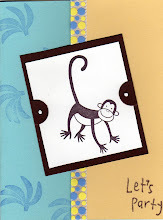 This is my favorite stamp set from Stampin' Up! It's a retired set, but I just can't bring myself to get rid of it. I love to paper piece him. So fun. I decided to make a little card collection out of some DP that I have laying around here. I'm trying hard not to buy paper, but to use what I have instead. My craft room is over run with paper. So, here is a set I came up with. 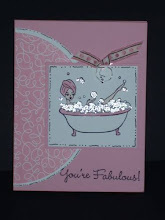 It's hard to see, but the base of the card is basic gray from Stampin' Up! I'm in love with this color combo. A little bit of Love for the love of my life! I absolutely adore my husband. He is always showing me ways he appreciates me by giving me flowers at least once a month, if not more (from the time of our first date 20 years ago), he always tells me he loves me, he leaves me notes in the morning if I am sleeping in. He does a lot. I'm not a romantic person at all. When I fix his lunch for him, I like to sometimes throw in a little love note in his lunch. After all, he appreciates it and the kids don't. I stopped doing it for them. LOL! It's just a little 3x3 card I made for his lunchbox. I love it. Not only did he show his construction worker co-workers, he took a picture of it and put it on his facebook. :D I'm getting better at showing my love, I did a little lipstick heart with an I love you message on the mirror for him the other morning. Baby steps...and it's only taken 20 years. Haahaa!! 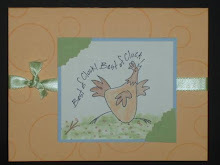 I am trying to come up with quick and easy cards to keep on hand for certain occasions. I was searching Pinterest and came across THIS card. Of course, mine doesn't look 1/2 as good, but I'm ok with it for now. Search like Google and earn points for prizes. I am a wife to a wonderful and amazing man, the mother of 4 awesome kiddos (2 girls, 2 boys, in that order). I love to craft and make cards. I sell Tastefully Simple along with my crafts. My family time is my real passion, although it is tough with them being older and doing more things on their own.